Although there is Google reader, irrespective of the OS for reading and organizing the feeds of various blogs that you read daily, sometimes a few good softwares/apps are helpful and work better and faster than Google Reader. 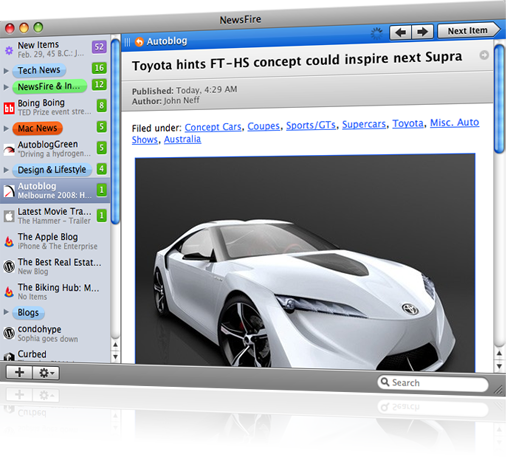 One of them is NewsFire app for Mac OS X, which is a very sleek app, which can organize the feeds of blogs and update itself with the latest posts of the blogs which you add in it. This app is so well organized that you get to see and read every post as reading it directly in the blog, and that too, the navigation is easy with the buttons to move to the next or previous article, and Bulbs indicating the number of unread items in each feed. You can add any number of blogs, categorize them and also search within the feeds, in the NewsFire app. RSS for Everyone – Simple to use and packed with features, NewsFire makes it a joy to keep atop the constant flow of information on the web. Smart & Organized – It’s easy to filter and organize your news with NewsFire’s smart groups. Build your own feeds with custom rules, or drag and drop to create groups of related content. Fit & finished – NewsFire’s feed list, floating new items to the top with smooth animation, is an original. It looks good. It moves well. It delivers the polished Mac experience you expect.